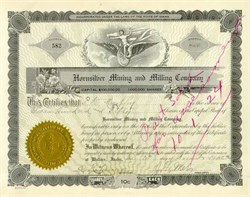 Beautifully engraved Certificate from the famous Hornsilver Mining and Miling Company issued in 1923. This historic document has an ornate border around it with a vignette of an allegorical figure riding a uni cycle with wings.. This item is hand signed by the company's president and is over 73 years old. The Hornsilver Mining and Milling Company, with offices in Wallace, Idaho, was incorporated May 31, 1901. Its capital consisted of 1,000,000 shares of stock with a par value of 10 cents per share. On June 11, 1946 the Articles of Incorporation were amended to increase the capital stock and extend corporate existence to perpetuity. The original claim included the Oregon, Jumbo, Idaho, Arizona, California, Utah, Colorado, Bolivar, and Nevada properties. By later locations, the Utah and Arizona were replaced by the Castle 9 and 10, and the California claim was dropped. The Montana and Peerless #15 were located to cover the area between the Peerless and Hornsilver groups. In 1954 the Tawny Girl was purchased from Julius Nuss in a compromise settlement of a law suit. In 1960 the Hornsilver consisted of ten unpatented lode claims in the Placer Center District northwest of Placer creek, 3 miles south of Wallace. The main ore was lead-silver. From 1920 to 1926 the tunnel was extended from 1,000 to 1,500 feet. After that time the only work done was annual labor and repair. Money was raised through stock assessments. In 1950 the office, which from 1929-1946 had followed manager Russell F. Collins on his moves to Coeur d'Alene, Seattle, and Leevining, California, was moved to the Day Building. On April 25, 1960, shareholders approved the sale of the real property to Day Mines, Inc. The company was liquidated on September 6, 1960. Officers of the company included: J.F. Mitz, President, 1901-1920; James R. Taylor, president, 1921; John F. Blitz, President, 1922-1923, O.R. Young, Secretary, 1921-1923; Ben F. Collins, president; Russell F. Collins, secretary-manager, 1924-1945; Walter H. Hansom, president, 1946-1958; L.J. Randall, secretary, 1946-1949; and S.F. Heitfeld, secretary, 1950-1958. In 1954 Henry L. Day became manager, and in 1959 he was president and manager of the company with R.W. Anno as secretary.